Founded in 2006, Wix.com is a leading website building platform with over 110 million users, in 180 countries. From online stores and businesses, to photographers and musicians, bloggers and brides, or just those wanting to explore new ideas – Wix makes it easy for anyone to build a website. You can get started with Wix for free – an email address is all it takes to sign up – or choose a Premium plan that fits your business or personal needs. Wix pricing for Premium plans start at $4.50/month up to $24.50/month. All Premium plans include a 14 day, money-back guarantee. The Wix platform offers a variety of options for adding media to your site. Simply drag and drop media elements onto your site, or explore the Wix App Market for even more features (many of them free). Audio: If you want to feature music on your site, Wix offers themed players that can be customized to match your site. For musicians, the Wix Music App lets you stream, share and sell your music and merch right from your site. And, you keep 100% of what you earn. In the Wix App Market, you can find other music solutions for your site, including the popular Spotify and SoundCloud players. Video: Add and embed videos on your site from your YouTube, Vimeo, Facebook and Dailymotion accounts. With the Wix Video App (free, or upgrade to Premium for more features), you can stream and sell videos from your YouTube, Vimeo or Facebook channels. Choose from a few layout options to customize the look of your video player, create channels and get people to subscribe to watch your videos on-demand. Photo Gallery: Want to show off your own photos? Great! Upload them. Don’t have any photos? Not a problem. Wix has three galleries where you can find 1000s of professional, high-quality images to use on your site – Free Wix Images, Free Wix Clip Art and Bigstock images (available for purchase, but at a discounted price). Plus, you can easily upload images from your social accounts and other cloud storage providers, including Facebook, Instagram, Picasa, Flickr, Dropbox and Google Drive. Once you’ve added images to your site, there are plenty of design features and Apps you can use to edit them without ever having to leave Wix. 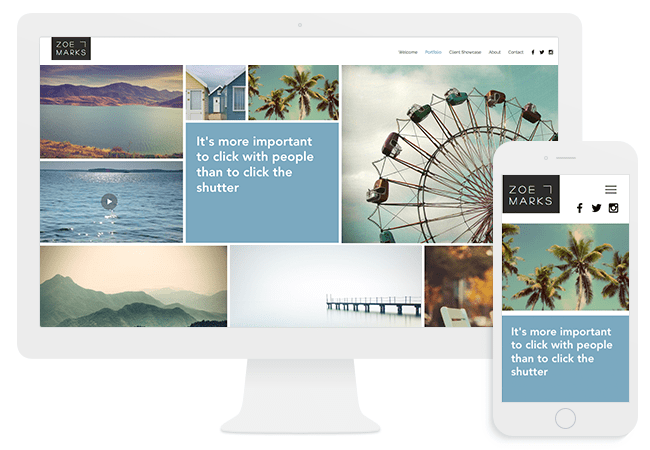 Frame your images, choose from 18 image filters, animate or showcase your work with one of their stylish galleries. All Wix image galleries accommodate photos, videos, and text. The Wix Pro Gallery specifically offers the added benefit of built-in image protection. Addicted to your social networks? Chances are Wix has your fix. The platform makes it easy to add and link all your social channels to your site, so you (and your followers) never miss a status update. Here are a few of the top social plug-ins you’ll find: Facebook, Instagram, Twitter, Pinterest, Google+, Flickr, LinkedIn, MySpace (if you’re still livin’ & lovin’ 2008), TripAdvisor (a service industry must), Vimeo, YouTube, and Yelp! And that’s only the most popular ones. Choose the social icons you need and create a custom social bar for your site. Additionally, you can explore the Wix App Market for a variety of social Apps, like Social Media Stream or Live Messenger, to boost user engagement with your site. Unlike the social bar which links to your social channels, these Apps display your social feeds directly on your site. When it comes to keeping in contact with your site visitors, Wix offers a wide range of options – both free and paid. Wix has partnered with Google in order to provide professional mailboxes connected to your domain (there is a fee for this) or you can connect your existing email. Or if you are using an external contact management system such as MailChimp or Constant Contact, Wix offers plug-in apps that will connect your account to your website. While there’s no doubt Shopify is the industry leader for online store builders, Wix is working hard to close this gap (and does a really good job of it when it comes to small businesses). A major benefit for using Wix as your online business solution is you get to keep 100% of what you earn. Wix offers a variety of online store templates suitable for any type of business – from fashion and clothing to home and decor. All of their online store templates are mobile-friendly and come with Wix Stores built in. If you choose a template from another category or start from scratch, you can easily add Wix Stores to your site from the Wix App Market. Wix Stores offers many impressive tools to help you create, manage and promote your online store. From your Store Manager, you can add all your products (with unlimited images, especially useful if your product comes in multiple colors or style options), create collections, set up your payment methods (secure checkout via debit and credit card, PayPal, Stripe and more), manage your orders, inventory and global shipping as well as stay in touch with your customers. Additionally, you can add a blog, easily create coupons, send marketing emails and post Facebook ads to promote sales or new products. As with any Wix website, you’ll get exceptional SEO tools that will help your business get found online. If you’re an artist interested in setting up shop, you should check out Wix Art Store. This free App lets you share, sell and print your art on a variety of products (mugs, pillows, tote bags) without you having to do a thing. Alternatively, you can opt to sell your items as digital files (ebooks, music, videos) available for instant download. You won’t have to worry about people stealing your creative property because all files you upload will include a custom watermark and you’ll be able to create your own digital license. Lastly, there are plenty of useful integrations you can find in the Wix App Market. Amazon, eBay eCommerce and Etsy Shop allow you to showcase your products from these sites right on your Wix site. While Apps like Tidio Live Chat, Live Messenger, Inffuse Testimonials and MyReviews let your customers contact you when they have a question or share their user experience. Unless you add a free online store App to your site (such as Online Store, Simple-e-Commerce or eCommerce), you will need to upgrade to a Premium plan to start selling products using Wix Stores. Premium plans including an online store cost $16.50/month or $24.50/month. If you’re already using Blogger, download the free Blogger App from the Wix App Market. 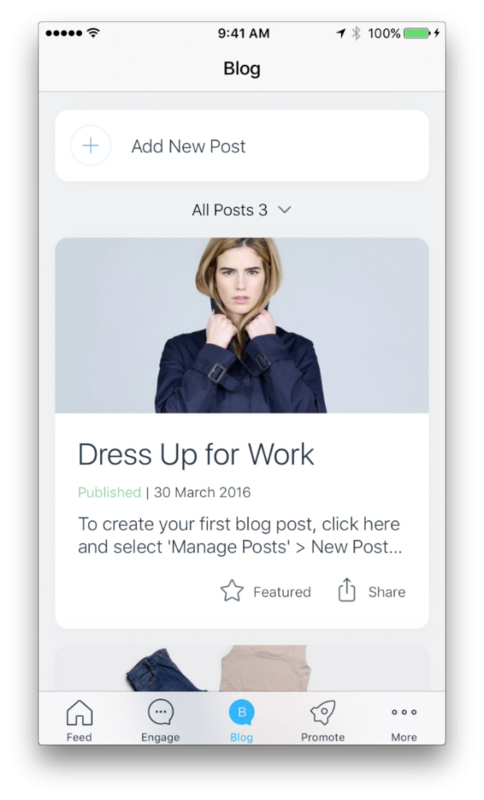 With the App, you’ll be able to feature and easily manage your posts all from your Wix site. Plus, you’ll get all the added benefits of the Wix Editor – from beautiful design features to social sharing tools – to make your blog posts even more engaging for readers. 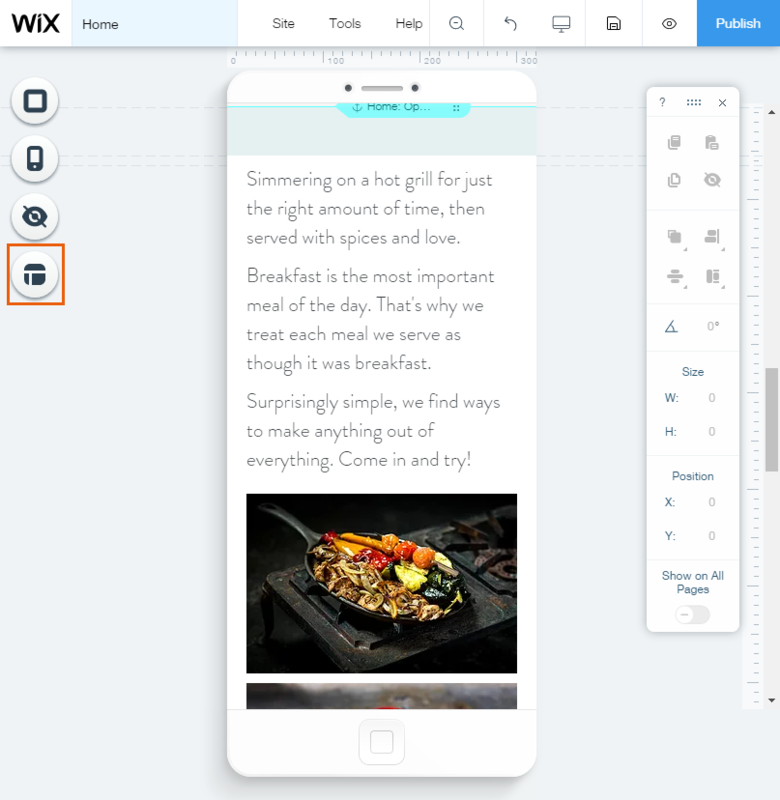 With the Wix Blog App (also free), you get a variety of layout options to present your words. Most exciting, the App seamlessly integrates with your site, offering a full suite of built-in social features so you can grow your readership without the extra work. Add and manage multiple writers, create member profiles, automatically publish and share posts on Facebook, send excerpts via email to subscribers when you have a new post, let fans leave comments with their own images, videos and more. You even get a breakdown of your blog stats and member activity – from site visits and page views to the number of social shares. Download the Wix Mobile app (available in the App Store and Google Play) for even more flexibility and blog on the go. Once your site is published, the Wix platform automatically starts collecting data about your visitors and how they interact with your site. You’ll get detailed stats about the number of visits, your most popular pages, how much time people spend on your site and how you rank compared to your competition. You’ll even learn more about your visitors themselves – what countries they come from, how they found you online and which devices they’re using to view your site. Wix Premium users with a connected domain receive additional stats and insights about their site from Google Analytics. All this info can help you make adjustments to your site to better meet the needs of your visitors and stay ahead of your competition. However, while this data is being gathered for you the moment you publish your site, a major con is you’re not able to view any of it if you’re not getting enough traffic to your site (meh). While you work on driving traffic to your site, check out the Wix App Market for tools to help you get a better understanding of your visitors’ behaviors. Apps like Visitor Analytics and Web-Stat are some of their most popular and well-reviewed. Wix makes an effort to offer a variety of professional and on-trend website templates for any type of business or personal interest. Currently, they have a gallery featuring 427 templates (this number growing every month). 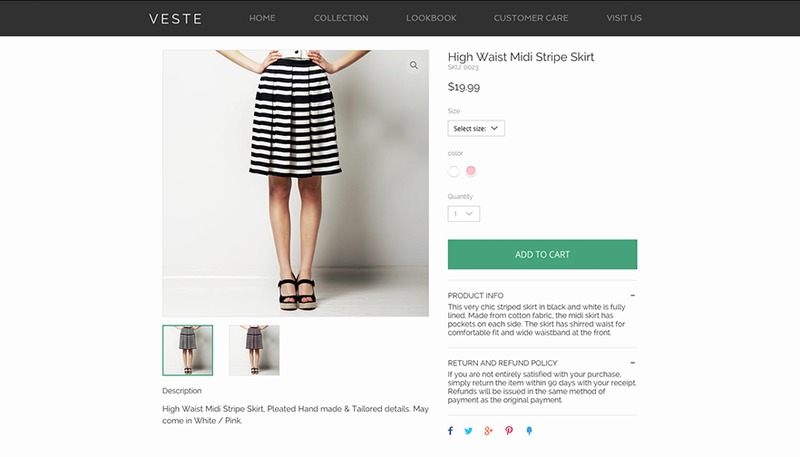 Explore all their templates or narrow down your search by choosing from specific categories, like Online Store, and even more detailed subcategories, like Fashion & Clothing, to find a template just right for you. Alternatively, you can choose from six blank templates, which look similar to a Google Slides presentation, or go wild and start completely from scratch. Whether starting from a Wix template, or going out on your own, anything can be customized. Just select the page element you want to change and drag and drop into place what you’d like instead. Upload your own media, your own fonts, connect your social accounts and more. Once you start editing your site, the design features and capabilities are quite impressive. With the image editor, you’ll be able to retouch and add filters without having to leave your site or use additional software. Other design features include video backgrounds, Strips (stretching images, video or text across the full-width of your site) and Parallax (a nifty 3-D effect created when visitors scroll through your site). Websites built with the Wix platform will adjust to different devices; although, none of the templates are “fully” mobile-responsive. To check how your site looks on mobile, switch to the mobile version of your site and make adjustments. The Mobile Editor is limited compared to the standard Wix Editor, but you’re still able to move and hide text, images and other page elements so they look the you want on mobile. If you’re unsure of where to start, use the Page Layout Optimizer tool. Select Optimize Now and the Mobile Editor will automatically edit your site so it looks good on mobile. Changes that you make in the Mobile Editor have no effect on the desktop version of your site and vice versa. If you have a business, enable the “Mobile Action Bar” feature so your visitors can contact you from their phone, email or social network in just a click. While we’re on the topic of mobile, Wix offers a companion App to their website building platform – the Wix App. This all-in-one App is especially useful for online stores, those offering a booking-type service and bloggers. Online stores will love the App’s notification settings for when customers make a purchase, being able to start a live chat with a new visitor or the ability to create and share social posts to instantly promote sales on Facebook and Instagram. Those offering online bookings can manage their business all from the App – from creating or modifying reservations, to managing staff schedules and even tracking their invoices. Meanwhile, bloggers can do everything from their phone that they can do from their desktop once they’ve set up their website. You can download the Wix Mobile app in the App Store and Google Play for free. Wix offers free and reliable hosting for all users – with over 99.9% uptime and uninterrupted service. If you upgrade to Premium, your domain is registered with Wix and connected directly to their hosting service. To note, any site built using the Wix platform can only be hosted with Wix. Let’s quickly define the two. Storage refers to the space available for the content of your website – the structure of a site you dedicated to your cat, images of your cat, videos of your cat, that audio file of a duet you sang with your cat. Bandwidth, to put it simply, is the amount of data that transfers through your site and the speed it takes. Two factors can have a major impact on your bandwidth: 1) The number of visitors to your site; and 2) The amount of time people spend on your site checking out your cat. When starting out, storage and bandwidth may not be of major concern. Either way, Wix has several plans with varied amounts of storage and bandwidth to fit most users’ website needs. Wix will track your storage space and how much bandwidth you’re using, so that you can change your plan as you see fit. Wix offers the largest selection of Apps – over 270 and counting. The Wix App Market is made up of Apps made by Wix as well as third-party Apps, many of which are free. You’ll find Apps to help you grow and manage your business, engage visitors on social, improve your site’s SEO and much more. Explore the Business Apps category to find Apps suited to your line of work, or look under the More Tools category to find Apps to increase the functionality of your site – like adding a chat, building forms, marketing tools and analytics. Easily add any web App to your site in just a click. Many of the Apps even include customization options, so you can truly make them a seamless part of your site. Some of Wix’s most popular Apps include Wix Forum, Wix Stores, Wix Events, Wix FAQ, Instagram Feed, Facebook Like Popup, Comments, Tidio Live Chat, Inffuse Testimonials and 123 Form Builder. Despite what you may have heard about Wix’s SEO, it’s actually good – really good! With Wix SEO Wiz, you get a personalized SEO plan for your website to help improve your ranking on search engines like Google. The plan analyzes and helps you select the best keywords for your site, suggests memorable URLs, creates meta-tags for your web pages and walks you through adding alt-text to images. Not too sure about meta-tags and alt-text? No worries. The Wiz will give you all the details, step-by-step, so you know exactly what you’re doing and why it’s important. Plus, you’ll be able to list your site with Google in just a click (mic-drop). In addition to Wix SEO Wiz, Premium users get all the benefits of Google Analytics. This includes tracking how visitors get to your site and understanding their behavior while they are on your site. Those who aren’t ready to go Premium (yet), can check out the Wix App Market for free SEO Apps, such as Rabbit SEO, rankingCoach, SEO Analytics and Site Booster. These Apps will help your site get found on top search engines, as well as give you tips on how to maintain a competitive edge online. It’s clear Wix makes support for its users one of their top priorities. Their 24/7 support center includes the comprehensive Wix Help Center (and knowledge base), email and phone support, a forum, as well as step-by-step video tutorials and instructional tooltips located in the Wix platform itself. In many instances, users can find answers to their questions by browsing articles in the Wix Help Center and exploring their trending help topics. If you need more assistance, submit a Support Ticket to receive a response via email or phone. Wix’s call center offers phone support in English, Spanish and Portuguese during operating hours (M-Th, 6am-5pm PST). You can schedule a call back, or submit a support ticket online. Moreover, Wix takes active strides in education in technology. The Wix Lounge in NYC serves as a free co-working space (albeit for members only), teaches workshops on how to create a Wix website, or use Wix to manage and grow your online business. Additionally, the Wix Lounge features regular Meetups/panel discussions with industry leaders on varied topics, such as Google and Wix! For those not in NYC, there are Wix Ambassadors worldwide and the Wix on the Road program. Wix on the Road is a global effort, presenting free web workshops to the public on a range of topics, like Design Trends, SEO 101 and Photo Tricks. Wix is free to sign up. You can upgrade to Premium to get even more features and benefits, such as your own domain, more storage, no Wix ads (some Premium plans still display Wix ads – read the fine print), your own favicon and more. Wix pricing for Premium plans ranges from $4.50/month to $24.50/month. Wix offers frequent sales throughout the year for first-timers upgrading to a Premium plan. They accept payment via Visa, MasterCard, American Express and Discover (←I know, who takes that). All Premium plans come with a 14 day, money-back guarantee. Read their quick FAQ, located below their package picker, if you have questions or want more details about their plans. Wix is one of the best, most comprehensive DIY website building platforms. 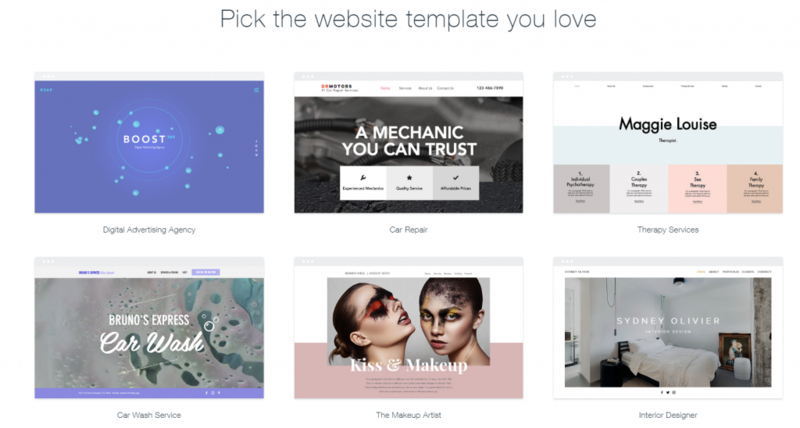 They offer nearly 500 designer-made templates, rich photo and video galleries, tons of designer tools and an intuitive drag and drop editor so that you can easily build a professional, one-of-a-kind website that fits your needs. Wix stands out from the competition when it comes to the Wix App Market, made up of 100s Wix and third-party Apps that you can add to your site in just a click. These Apps can increase your site’s functionality, add entertainment value, boost engagement among your visitors, and improve the way you do business online. Wix is an optimal website building platform for small to medium businesses, online stores, hotels, restaurants, bloggers, and professionals that want to showcase and sell their art online (photography, music, and video). While Wix doesn’t have the most responsive design when it comes to mobile devices, their Mobile Editor provides a quick fix to most issues. Additionally, Wix may not be the first choice for those building an online store, especially when compared to Shopify, but it certainly is a firm contender for small businesses.